This article examines how Diderot, after some initial reservations, praised the sketch as a process of artistic and intellectual creation that highlights the singular “faire” of the artist or thinker. He joined in an original manner a tradition that accorded an increasing value to the sketch, as much in the art market as on the theoretical level. The freedom of the sketch – sometimes associated with libertinage – consists in an energetic economy of the sign that privileges intensity and expressivity. The aesthetics of incompletion appeals to the public’s imagination. The perfection of the finite is replaced by the materiality of the creative act, the pleasure of indetermination and the dance of the mind. Eighteenth-century descriptions of esprit and the persona of the thinker often insisted on the interplay of “le physique et le moral.” This idea was often illustrated through analogies that compared the embodied mind to a device that operated via fine-tuned response and motion. Whereas physicians used such analogies to warn scholars about the health dangers of overstudy, other authors deployed them for positive, heuristic purposes. The two main examples examined here are Montesquieu and Diderot, who figured the complexities of thinking through models that included musical instruments, the “spider in its web,” and the mechanical apparatus known as the tableau mouvant. This article examines the ambiguous relationship between the notions of “instinct” and “intelligence” in eighteenth- and nineteenth-century natural history and zoology. It pays particular attention to the ways in which the instinct/intelligence antithesis was employed in debates over the nature of humans versus animals, from Buffon and Condillac to the entomologist Jean-Henri Fabre. It also examines the function of this conceptual binary in social theory, like that of Jean-Jacques Rousseau and the socialist utopian Pierre-Joseph Proudhon. By highlighting instances in which the distinction between instinct and intelligence collapsed, it reveals some of the conceptual bridges that established a secret continuum between them. Could madness be rooted in the “heart”? This question has accompanied psychiatry from its birth around 1800 to the dawn of the twentieth century, throughout the turning points in its history, marked by a tension between psychologism and organicism. The “heart” of madmen, metaphorical or not, always based in a physiology of emotions, was thus the object of speculative or statistic approaches that obstinately aimed to confer a medical status upon it. The poor success of these attempts, or their outright failures, highlight the energy that psychiatrists applied to recalling or renewing them. 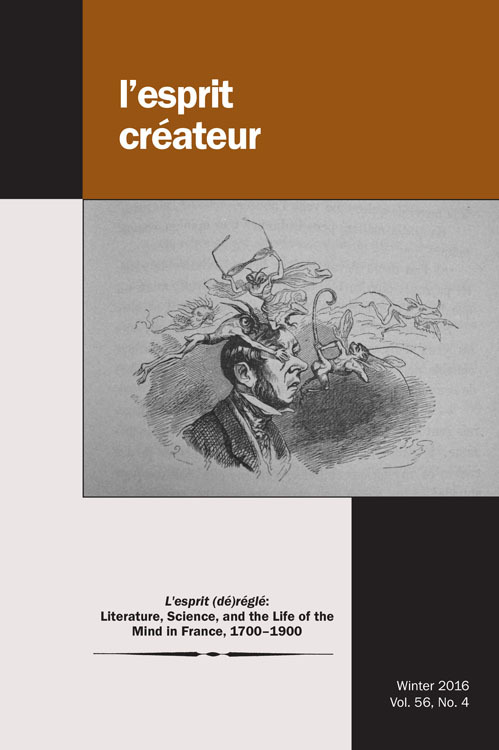 At the end of the nineteenth century, the revival of the fantastique drew largely upon the clinical study of the life of the mind to inspire the fear and astonishment of a reader confronted with a henceforth naturalized supernatural. Taking as a point of departure the “study of demented thought” put forth in Jules Lermina’s Histoires incroyables (1885), this article intends to show that the blurring of the normal and the pathological (Broussais’s hypothesis), but also of the voluntary and the involuntary (Baillarger’s hypothesis), became veritable poetic forces in numerous ‘fin de siècle’ narratives. Through the prism of the transformations that take place in the mind of its protagonist, Boussenard’s novel reveals a fundamental tendency toward the “scientification of the supernatural” in the closing years of the nineteenth century, and the resistance the supernatural puts up against this development. The mind of Monsieur Synthèse, always eager to push back the limits of science, shows itself to be deeply fragmented: he maintains a pathological and potentially pathogenic connection to science, while his mysterious friend Krishna seems to suggest an entirely different manner of conceptualizing the association between science and the supernatural. This article examines the convergence, at the end of the nineteenth century, of a disciplinary confrontation between medicine and psychology on the subject of internal language, and the publication of the first internal monologue, Édouard Dujardin’s Les lauriers sont coupés (1888). When attempting to describe the nature of internal language, doctors and psychologists identified traits that coincide with the poetics of the internal monologue. The increasing hegemony of medicine conferred an epistemological primacy to the brain, to the detriment of the mind, while the internal monologue marked the advent of a literary representation of the life of the mind which broke with the tradition of psychological analysis. Theater was at the heart of the life and works of French psychologist Alfred Binet (1857–1911). Prior to his involvement in writing and staging plays with the dramatist André de Lorde (1869–1942), the famous inventor of the first metric scale of intelligence had, in fact, conducted an extensive psychological study on the doubling of personalities experienced by actors and dramatic authors. By returning to his psychological and dramatic works, and detailing the links between them, this article intends to show how Binet made theater into the veritable laboratory of his scientific psychology. The notion of “intelligence” rearticulated the nature and limits of psychic life in the latter half of the nineteenth century. This article analyzes one stage in the genealogy of “intelligence,” focusing on passages from Hippolyte Taine’s De l’intelligence (1870) and Henri Bergson’s L’évolution créatrice (1907). Taine and Bergson describe two divergent paths – the artificial and the vital – mapping out the looming cognitive and philosophical terrain for thinking about intelligence and its influence on modern French thought and literature.